An excerpt from Delorme’s Réflexions diverses sur Haïti (1873). 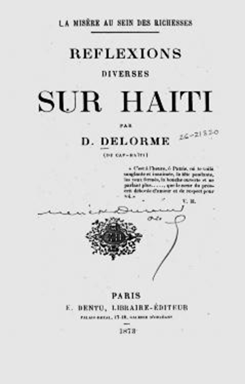 Delorme an intellectual and politician who opposed President Geffrard. 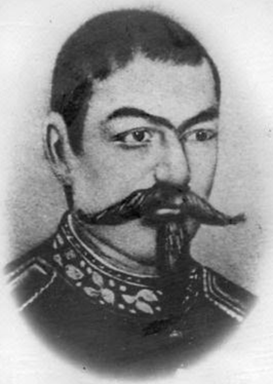 When Geffrard’s rival, Sylvain Salnave, marched on Cap Haïtien with a small army of Dominican militia, Delorme joined the revolution. Below, Delorme describes how Geffrard trapped Salnave in Cap Haïtien. When the revolution dissipated, Salnave and Delorme escaped aboard the U.S.S. DeSoto. From my own perspective, I detested this government. It was useless to the country and it killed to no end. I wanted it to fall. But I did not associate myself with the conspiracies that formed nearly every month. I feared the consequences of agitating. Salnave took over Cap [Haitien] at five o’clock in the morning. The military and civilian leaders joined him at eight or nine o’clock. And most local inhabitants in the city quickly surrendered after their accession, which made this a revolution… I was late [to join]. I had been reluctant to involve myself in this affair. But the moment that I decided to take part, I felt like I was bound by duty and by honor. The revolution [was stopped] on Ennery street due to its slow movement in the first days. The government troops marched on Cap [Haitien] and surrounded it. The approaching dangers did not make me abandon the cause that I had adopted. Even though I was not the first to join the revolution, I would not be the first to turn my back on it. I would not desert it. I believed that it was my duty not to abandon the city to the misfortunes that menaced it. And I would stay at my post in this difficult moment of peril and thwart as best as I could the violence that is inherent in these exceptional situations. This was the role I played in the siege, as it was in my power. I hope there will be people without passion that will provide testimony of my efforts night and day to stop the misery and the chaos amidst a population that was suffering because of the famine. After five months under a siege that was courageously opposed by the inhabitants, Cap Haitien finally fell to the government which had help from foreign auxiliaries. I went into exile. Eight months later, the government fell in turn. I was in Belgium…. I returned, but it was long after the government had fallen [. My return was] without haste, without ambition, happy to be back in my country, and alive in my mind was my cherished dream of a peaceful existence in the countryside with my books.